How empty our plot looks from a few months ago. Although we’re still enjoying the last of the kale, harvesting the swede and broccoli, and next year’s garlic has started sprouting merrily, most of the beds are now having a breather. Ade has worked hard tidying these up, digging over the soil and enriching the earth with well-rotted matter so they can rest up over the winter. 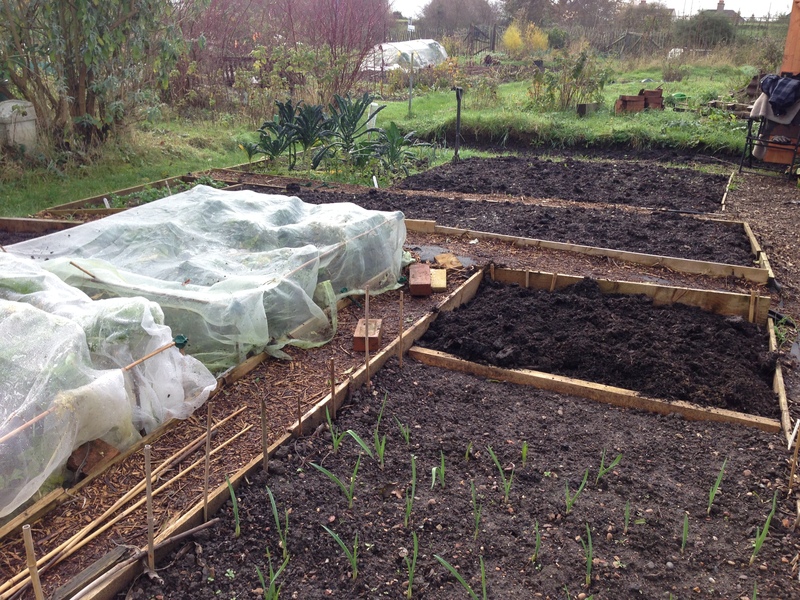 Come spring, the beds will all be super fertile (we hope!) and ready for some serious veg-growing action. Previous Where to Hang my Baubles? The soil looks nice and weed-free! Great garden! You are going to have such fun choosing seed for next year. I use my raised beds in my Kitchen Garden as a living larder- which means I keep carrots and beetroot in the ground right up until February, pulling them as I need them. It means I get covered in mud on a regular basis…..but, hey, that’s good too! I love the idea of a living larder, Karen, what a great idea! Alas, this isn’t our garden, but our allotment plot, so sadly it’s not conveniently outside our back door for harvesting bits as and when we need them, we have to plan a little bit more ahead than that! It’s only a ten minute walk from our house though, which is still pretty good. And you’re right, we’re loving planning what we’re going to plant next year!